Melchizedek, Melchisedech, Melkisetek, or Malki Tzedek (/mɛlˈkɪzədɛk/; Hebrew: מַלְכִּי־צֶדֶֿק malkī-ṣeḏeq, "king of righteousness"; Amharic: መልከ ጼዴቅ malkī-ṣeḏeq; Armenian: Մելքիսեդեք, Melkisetek), was the king of Salem and priest of El Elyon (often translated as "most high God ") mentioned in the 14th chapter of the Book of Genesis. He brings out bread and wine, and then blesses Abram and El Elyon. Chazalic literature—specifically Targum Jonathan, Targum Yerushalmi, and the Babylonian Talmud—presents the name מלכי־צדק)) as a nickname title for Shem, the son of Noah. In Christianity, according to the Epistle to the Hebrews, Jesus Christ is identified as "a priest forever in the order of Melchizedek", and so Jesus assumes the role of High Priest once and for all. In the majority of Masoretic Hebrew texts the name is written as two words, Meleḵi-ṣedeq מלכי־צדק‎, rendered in one word in both the Septuagint (Μελχισεδέκ) and Vulgate (Melchisedech). The Authorised King James Version of 1611 renders the name Melchizedek when translating from the Hebrew, and Melchisedec in the New Testament. The name is formed in parallel with Adoni-ṣedeq אדני־צדק‎, also a king of Salem, mentioned in the Book of Joshua (10:1–3), where the element malik "king" is replaced by adon "lord". Parallel theophoric names, with Sedeq replaced by Yahu, are those of Malchijah and Adonijah, both biblical characters placed in the time of David. Melchizedek is mentioned twice in the Hebrew Bible, the first in Genesis and the second in Psalms. And Melchizedek king of Salem brought out bread and wine: and he was [is] the priest of the most high God. And he blessed him, and said, 'Blessed be Abram to the most high God, possessor of heaven and earth, And blessed be the most high God, which hath delivered thine enemies into thy hand'. And he gave him tithe from all. Some textual critics classify the narration as not being derived from any of the usual pentateuchal sources. It has been speculated that verses 18–20 (in which Melchizedek appears) are an informal insertion into the narration, as they interrupt the account of the meeting of Abraham with the king of Sodom. :56 There is no consensus on when or why the story was added. It may have been inserted in order to give validity to the priesthood and tithes connected with the Second Temple. :59-60 It also may have been inserted to give validity to the superiority of the Zadokite priests over the Levite priests. Lebanese Protestant scholar Kamal Salibi (1929–2011) observes that Hebrew: ֹמַעֲשֵׂר, m'sr, which literally does mean tenth, might more loosely be used to mean portion, and Hebrew: מִכֹּל, m-kl, or from all, might refer just to food in the giver's possession, so that the whole verse might mean He gave him a portion of food..
Genesis 14:18 introduces Melchizedek a "Priest of the Most High God" (El Elyon), a term which is re-used in 14:19, 20, 22. The term "Most High" is used another twenty times of the God of the Israel in the Psalms. Giorgio Levi Della Vida (1944) suspects that this is a late development, and Joseph Fitzmyer (1962) connects Genesis 14 with the mention of a god called "Most High," who may appear according to one of three possible translations of a 750 BC inscription found at Al-Safirah in Syria. Remi Lack (1962) considers that the Genesis verses were taken over by Jewish redactor(s), for whom El was already identified with YHWH, El-Elyon became an epithet for the God of Israel. Due to an ambiguity in the Hebrew text, it is unclear who gave tithe to whom: Abram to Melchizedek, or Melchizedek to Abram: the verse in question states simply, "And [he] gave him tithe from all" (v-yiten-lo ma'aser mekol, ויתן לו מעשר מכל‎). Most translations of this verse preserve the ambiguity, as in the Septuagint, which has edōken autōi, ἔδωκεν αὐτῷ "he gave to him", but some modern translations make explicit the mainstream interpretation of Abram being the giver and Melchizedek the recipient. Targum Pseudo-Jonathan, the Book of Jubilees, Josephus, Philo of Alexandria, and Rashi all read Abram as the giver of the tithe to Melchizedek. The Rogatchover Gaon, also understanding Abram to be the tithe giver, comments that the presented tithe was not a standard tithe (Maaser Rishon) as described in the Torah (given on an annual basis), but was a one-time "tribute offering" (trumat ha-mekhes, תרומת המכס), such as Moses gave to God in Numbers 31:41. Expressing a kabbalistic point of view, the Zohar commentary to Genesis 14 cites Rabbi Yitzchak as saying that it was God who gave a tithe to Abram in the form of removing the Hebrew letter He from his own throne of glory and presenting it to the soul of Abram for his benefit. Rabbi Meir Simcha of Dvinsk (1843–1926) interprets the phrase "And he gave him tithe from all" as a verbal continuation of Melchizedek's speech, i.e., Melchizedek exclaimed that God had chosen to gift Abram a tenth of God's possession of the entire human race (consisting of seventy nations as described in Genesis) in the form of the seven nations of the land of Canaan, including the cities of Sodom that Abram succeeded in saving. Rabbi Meir Simcha argues that continued speech of this sort was a common form of prophetic expression. Hebrews Chapter 7 verses 1 and 4 in the New Testament state that the patriarch Abraham gave a tenth of the spoil to Melchizedek. The Samaritan Pentateuch reads שלמו (lit. "his peace" or in contextual flow "allied with him") in place of the Masoretic שלם (Salem), with addition of a letter ו (vav). William F. Albright views the Samaritan wording as authentic as does the New American Bible Regarding the residence of Malkizedek, Samaritan tradition identified a "Salem" as a place on the slopes of Mount Gerizim which served as a blessing place of the children of Israel upon their initial crossing of the Jordan river. The Samaritans allocate Gerizim (and not Jerusalem) as the site intended for the Temple, and thus the "שלמו" text serves an obvious sectarian purpose. However, this practice is not solely associated with the Samaritans: the possessive suffix is also found in the 3rd- or 2nd-century BCE Book of Jubilees, and Greek possessive suffixes are even used in the Septuagint version of Genesis. 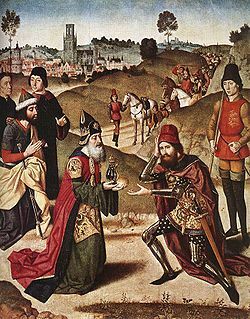 Another alternative keeps Melchizedek as a personal name but changes the identity of the person addressed: "You are a priest forever by my order (or 'on my account'), O Melchizedek" – here it is Melchizedek who is being addressed throughout the psalm. The majority of Chazalic literature attributes the primary character of the psalm as King David who was a "righteous king" (מלכי צדק) of Salem (Jerusalem) and, like Melchizedek, had certain priest-like responsibilities, while the Babylonian Talmud understands the chapter as referring to Abram who was victorious in battling to save his nephew Lot and merited priesthood. The Zohar defines the noted Melchizedek as referring to Ahron the Kohen Gadol (high priest). Psalm 110:4 is cited in the New Testament letter to the Hebrews as an indicator that Jesus, regarded in the letter as the Messiah, had a right to a priesthood pre-dating the Jewish Aaronic priesthood (Hebrews 5:5–6). Josephus refers to Melchizedek as a "Canaanite chief" in War of the Jews, but as a priest in Antiquities of the Jews. Philo identifies Melchizedek with the Logos as priest of God, and honoured as an untutored priesthood. The Second Book of Enoch (also called "Slavonic Enoch") is apparently a Jewish sectarian work of the 1st century AD. The last section of the work, the Exaltation of Melchizedek, tells how Melchizedek was born of a virgin, Sofonim (or Sopanima), the wife of Nir, a brother of Noah. The child came out from his mother after she had died and sat on the bed beside her corpse, already physically developed, clothed, speaking and blessing the Lord, and marked with the badge of priesthood. Forty days later, Melchizedek was taken by the archangel Gabriel (Michael in some manuscripts) to the Garden of Eden and was thus preserved from the Deluge without having to be in Noah's Ark. 11Q13 (11QMelch) is a fragment (that can be dated to the end of the 2nd or start of the 1st century BC) of a text about Melchizedek found in Cave 11 at Qumran in the Israeli Dead Sea area and which comprises part of the Dead Sea Scrolls. In this eschatological text, Melchizedek is seen as a divine being and Hebrew titles such as Elohim are applied to him. According to this text Melchizedek will proclaim the "Day of Atonement" and he will atone for the people who are predestined to him. He also will judge the peoples. The Genesis Apocryphon (1QapGen) repeats information from Genesis. The Qumran Scrolls, also indicate that Melchizedek was used as a name of the Archangel Michael, interpreted as a heavenly priest; Michael as Melchi-zedek contrast with Belial, who is given the name of Melchi-resha "king of wickedness". The text of the Epistle to the Hebrews follows this interpretation in stating explicitly that the name in Greek translation (ἑρμηνευόμενος) means βασιλεὺς δικαιοσύνης ("king of righteousness"), omitting translation of the possessive suffix; the same passage interprets Melchizedek's title of king of Salem as translating to βασιλεὺς εἰρήνης "king of peace", the context being the presentation of Melchizedek's as an eternal priesthood associated with Jesus Christ (ἀφωμοιωμένος δὲ τῷ υἱῷ τοῦ θεοῦ μένει ἱερεὺς εἰς τὸ διηνεκές "made like unto the Son of God abideth a priest continually"). Hebrew language Torah commentarians of the Rishonim era (11th to 15th centuries) have explained the (seemingly) abrupt intrusion of Melchizedek into the narration in various ways; Hezekiah ben Manoah (c. 1250) points out that the following verses has Abram refusing any of the king of Sodom's possessions which, if not for the insertion of Melchizedek's hospitality, would prompt the query as to where Abram and his weary men got their refreshments from. The Rashbam, Shmuel ben Meir (11th century), offers a similar explanation but varies by saying that only Abram's men partook in the booty (originally belonging to the king of Sodom) whereas the Melchizedek intrusion explains that Abram himself was sustained by Melchizedek since he refused to consume of the luxury of Sodom because his Lord was of the non-material world. Likewise, the commentary of Chaim ibn Attar (17th century) offers a three-pronged slew of reasons for the Melchizedek insertion. The narrative preceding Melchizedek's introduction presents a picture of Melchizedek's involvement in the events of his era. The narration details Abram's rescue of his nephew Lot and his spectacular defeat of multiple kings, and goes on to define the meeting place of Melchizedek and Abram as "Emek HaShaveh which is Emek HaMelech". The meeting site has been associated with Emek Yehoshaphat (the Valley of Josaphat). Targum Onkelos describes the meeting location's size as "a plot the size of a king's Riis". Midrashic exegesis describes how a large group of governors and kings convened in unison to pay homage to the victor Abram and desired to make him a deity, at which point he declined, attributing his victory to God's might and will alone. The chronological work Seder ha-Dorot (published 1769) quotes that Melchizedek was the first to initiate and complete a wall in circumference of the city, and had to exit Salem to reach Abram and his men. Upon exiting Salem, he presented to them "bread and wine" with the intent to refresh them from their journey. Assuming the premise that Melchizedek was Shem, he would have been 465 years old at the time and Abram was 75 years of age. Chazalic literature unanimously identify Melchizedek as Shem son of Noah (Targum Yonathan to Genesis chap. 14, Genesis Rabbah 46:7, Babylonian Talmud to Tractate Nedarim 32b). The Talmud Bavli attributes him (Shem and his beth din court of justice) as pioneers in banning prostitution (Avodah Zarah p. 36a). There is, however, disagreement amongst Rishonim as to whether Salem was Melchizedek/Shem's allocated residence by his father Noah or whether he was a foreigner in Salem which was considered the rightful land of his brother Cham. 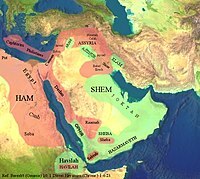 The Ramban is of the opinion that the land was rightfully owned and governed by the offspring of Cham, and explains that Melchizedek/Shem left his home country and came to Salem as a foreigner wishing to serve God as a Kohen. However, Rashi maintains that the land of Canaan was initially allotted to Shem, by Noah his father, and the offspring of Cham conquered the land by forced expansion. Although Melchizedek is the first person in the Torah to be titled a Kohen (priest), the medrash records that he was preceded in priesthood (kehuna) by Adam. Rabbinic commentarians to the Torah explain that Melchizedek – (sometimes associated with Shem) – was given the priesthood (Hebrew; kehuna) by receipt of his father Noah's blessing "G-d beatified Yefeth and will dwell in the house of Shem"; i.e., he will merit to serve and host God as a Kohen. Torah Laws require that the Kohen (priest) must be a patrilineal descendant of a prior Kohen. Leviticus Rabbah maintains that God intended to permanently bring forth the priesthood ("Kehuna") through Melchizedek's patrilineal descendants, but since Melchizedek preceded Abram's blessing to that of God, God instead chose to bring the priesthood ("kehuna") forth from Abram's descendants. As the text states in regard to Melchizedek; "and he is a Kohen", meaning himself in the exclusive sense and not his patrilineal descendants. The Ohr HaChayim commentary presents that God was not angered by Melchizedek's preceding Abram's blessing to that of God, since Abram was rightfully deemed worthy of precedence for independently coming to recognize God amidst a world of Paganism, but Melchizedek willingly gave the priesthood to Abram upon recognizing his outstanding uniqueness and Godly character traits. Rabbinic authorities differ as to whether Kehuna was given to Abram there and then or after the demise of Melchizedek. The Midrash records that Shem functioned as kohen gadol (high priest) in that he taught Torah to the Patriarchs before it was publicly given at Mount Sinai, while the official title of High Priest was conferred upon Aaron after the erection of the Tabernacle. The Midrash quotes multiple aspects of both Melchizedek and Abram; The Rabbis taught that Melchizedek acted as a priest and handed down Adam's robes to Abram (Numbers Rabbah 4:8). Rabbi Isaac the Babylonian said that Melchizedek was born circumcised (Genesis Rabbah 43:6). Melchizedek called Jerusalem "Salem." (Genesis Rabbah 56:10.) The Rabbis said that Melchizedek instructed Abram in the Torah. (Genesis Rabbah 43:6.) Rabbi Eleazar said that Melchizedek's school was one of three places where the Holy Spirit (Ruach HaKodesh) manifested Himself (Babylonian Talmud Makkot 23b). Rabbi Judah said in Rabbi Nehorai's name that Melchizedek's blessing yielded prosperity for Abram, Isaac, and Jacob (Genesis Rabbah 43:8). Ephraim Miksha'ah the disciple of Rabbi Meir said in the latter's name that Tamar descended from Melchizedek (Genesis Rabbah 85:10). Rabbi Hana bar Bizna citing Rabbi Simeon Hasida identified Melchizedek as one of the four craftsmen of whom Zechariah wrote in Zechariah 2:3. (Babylonian Talmud Sukkah 52b; see also Song of Songs Rabbah 2:33 (crediting Rabbi Berekiah in the name of Rabbi Isaac).) The Talmud teaches that David wrote the Book of Psalms, including in it the work of the elders, including Melchizedek. Thus according to Jewish legend, confusion over Melchizedek being both King and Priest is solved by knowing that Shem was also a progenitor of the Davidic Monarchy, which descended from both Judah and Tamar, who was sentenced to 'death by fire' when accused of committing prostitution as the daughter of high priest Shem. The Zohar (redacted by Moses de León c. 1290s) finds in "Melchizedek king of Salem" a reference to "the King Who rules with complete sovereignty". or according to another explanation, that "Melchizedek" alludes to the lower world and "king of Salem" to the upper world (Zohar 1:86b–87a). The Zohar's commentary on Genesis 14 cites a Rabbi Yitzchak as saying that it was God who gave tithe to Abram in the form of removing the Hebrew letter He from his throne of glory and presenting it to the soul of Abram for his benefit. The letter he is the letter God added to Abram's name to become "Abra-ha-m" in Genesis. In the New Testament, references to Melchizedek appear only in the Epistle to the Hebrews (later 1st century to early 2nd century, AD), though these are extensive (Hebrews 5:6, 10; 6:20; 7:1, 10, 11, 15, 17, 21). Jesus Christ is there identified as a priest forever in the order of Melchizedek quoting from Ps. 110:4. The association or identification of Melchizedek with the Messiah predates Christianity, developing in Jewish messianism of the Second Temple period. A collection of early Gnostic scripts dating on or before the 4th century, discovered in 1945 and known as the Nag Hammadi library, contains a tractate pertaining to Melchizedek. Here it is proposed that Melchizedek is Jesus Christ. Melchizedek, as Jesus Christ, lives, preaches, dies and is resurrected, in a gnostic perspective. The Coming of the Son of God Melchizedek speaks of his return to bring peace, supported by the gods, and he is a priest-king who dispenses justice. The association with Christ is made explicit by the author of the Epistle to the Hebrews, where Melchizedek the "king of righteousness" and "king of peace" is explicitly associated with the "eternal priesthood" of the Son of God. The Christological interpretation of this Old Testament character being a prefiguration or prototype of the Christ has varied between Christian denominations. The Pelagians saw in Melchizedek merely a man who lived a perfect life. Typological association of Jesus Christ with Old Testament characters occurs frequently in the New Testament; thus, Jesus Christ is also associated with Adam (as the "New Adam") and with Abraham. Melchizedek is mentioned in the Roman Canon, the First Eucharistic Prayer of the Roman rite of the Catholic Church, and also figures in the current Roman Martyrology as a commemoration on August 26. He is commemorated in the Eastern Orthodox Church on May 22, and on the "Sunday of the Forefathers" (two Sundays before Christmas). In the Calendar of Saints of the Armenian Apostolic Church Melkisetek (Armenian: Մելքիսեդեք, Melkisetek) is commemorated as one of the Holy Forefathers on July 26. Traditional Protestant Christian denominations, following Luther, teach that Melchizedek was a historical figure and an archetype of Christ. Tremper Longman notes that a popular understanding of the relationship between Melchizedek and Jesus is that Melchizedek is an Old Testament Christophany – in other words, that Melchizedek is Jesus. In the Latter Day Saint movement, the Book of Mormon makes reference to Melchizedek (Alma 13:17–19). These priesthoods are laid out by Smith in (Doctrine and Covenants 107:1-2,4,6-10,14,17-18,22,29,71,73,76) as well as more than twenty additional references in that work. According to Encyclopædia Britannica, Joseph Smith "appointed his male followers to priesthoods, named for the biblical figures Melchizedek and Aaron, that were overseen by the office of High Priest", incorporating selected practices from the Hebrew Bible. ^ Targum Yonathan and Targum Yerushalmi to Bereishith 14:18–20. Talmud Bavli to tractate Nedarim 32b et al. ^ a b c d Blenkinsopp, Joseph (2015). Abraham: The Story of a Life. Wm. B. Eerdmans Publishing. p. 56. ISBN 978-0-8028-7287-6. ^ Strong's Concordance no. 4428 and 6666. ^ a b van der Toorn, K.; et al. (1996). Dictionary of Deities and Demons in the Bible. Wm. B. Eerdmans Publishing. p. 560. ^ A Hebrew and English Lexicon of the Old Testament with an appendix containing the Biblical Aramaic, written by Francis Brown, Samuel Rolles Driver and Charles Augustus Briggs, based on the Hebrew lexicon of Wilhelm Gesenius as translated by Edward Robinson, Oxford: The Clarendon Press, 1906, p. 575. ^ Ramban, bereishith chap. 14, opines that the name implies "my king is tzedek", based on the notion that the city of Salem is associated with the attribute of righteousness. ^ Speiser, E. A. "Genesis. Introduction, translation, and notes" (AB 1; Garden City 1964) p. 105; Von Rad, "Genesis", pp. 170, 174; Noth, Martin. "A History of Pentateuchal Traditions" (Englewood Cliffs 1972) p. 28, n. 84. ^ Merriam-Webster's Encyclopedia of World Religions. Encyclopaedia Britannica Publishers, Inc. Staff. p. 708. ^ Alter, Robert (2004). The Five Books of Moses. W. W. Norton & Co. p. 70. ISBN 0-393-01955-1. Employment of the verb without a subject, not uncommon in biblical usage, occurs at the end of verse 20, where the Hebrew does not state what the context implies, that it is Abram who gives the tithe. ^ The Revised English Bible. Oxford University Press, Cambridge University Press. 1989. p. 11. ^ Hayward, C. T. Robert (2010). Targums and the transmission of scripture into Judaism and Christianity. Koninklijke Brill NV. p. 15. Targum Pseudo-Jonathan makes it clear that Abraham paid tithes to Melchizedek, as does the interpretation adopted by Jub. 13.25–27; Josephus Ant. 1.181; Philo Cong. 93, 99; and, of course, the epistle to the Hebrews [7:4]. ^ Herczeg, Yisrael Isser Zvi (1995). The Torah: With Rashi's Commentary Translated, Annotated, and Elucidated. Mesorah Publications. p. 140. ^ Zohar Chodosh to Bereishit chap. 14 (the Zohar text, however, does not state that a name change to "Abra-ha-m" occurred at this point). ^ Albright reads melek shelomo (מלך-שלמו), "of his peace", instead of melek Salem, "king of Jerusalem", brought out bread and wine..." Albright, W. F. "Abram the Hebrew: A New Archaeological Interpretation", BASOR 163 (1961) 36–54, esp. 52. ^ Jutta Leonhardt Jewish worship in Philo of Alexandria 2001 p216 "IIl 82 Philo also identifies Melchizedek with the Logos as priest of God. Thus Melchizedek, Although Philo interprets the Jewish first-fruit offering and quotes the Jewish laws, the general context is still Cain's sacrifice." ^ Fred L. Horton The Melchizedek Tradition: A Critical Examination of the Sources 2005 p170 "In the Genesis Apocryphon Melchizedek is brought into connection with Jerusalem (as he is later in Josephus), and in Philo Melchizedek is honored as the possessor of an unlearned and untutored priesthood, indeed as a representation"
^ Harry Alan Hahne (2006). Corruption and Redemption of Creation: the Natural World in Romans 8.19–22 and Jewish Apocalyptic Literature. p. 83. ISBN 0-567-03055-5. ^ Morfill, W R (translator). The Book of the Secrets of Enoch. ^ The Melchizedek Tradition: A Critical Examination of the Sources p. 85 Fred L. Horton – 2005 "Interestingly enough, we see that the Genesis Apocryphon offers no unique information about Melchizedek. Josephus gives three items of information not found in the other sources, and Philo four." ^ Pearson, Birger A. (2003). "Melchizedek in Early Judaism, Christianity and Gnosticism". In Stone, Michael E.; Bergren, Theodore A. (eds.). Biblical Figures Outside the Bible. p. 181. ISBN 978-1-56338-411-0. Gareth Lee Cockerill, The Epistle to the Hebrews, vol. 29 of The New International Commentary on the New Testament Author, Wm. B. Eerdmans Publishing, 2012, 298f. (fn. 14). ^ Willard M. Swartley, Covenant of Peace, Wm. B. Eerdmans Publishing, 2006, p. 255. Gary Staats, A Christological Commentary on Hebrews (2012), p. 71: "[The writer of Hebrews] is identifying Melchizedek as a king of righteousness and a king of peace. He thus becomes a beautiful type of Jesus Christ who is also the final King of righteousness and the final King of peace." ^ a b seder hadoroth p. 9b. ^ In Gen. 14:19–20, a precedence not befitting a kohen who is to be of total service to God – Eitz Yosef to Leviticu Rabbah 25:6. ^ Rabbi Zechariah, quoting Rabbi Ishmael; Leviticus Rabbah 25:6, Babylonian Talmud to Nedarim 32b. Zohar vol. 1 p. 86b. ^ Ginzberg, Louis (1909). The Legends of the Jews Volume III: Judah and His Sons (Translated by Henrietta Szold) Philadelphia: Jewish Publication Society. ^ Robinson, James M (translator) (1978). The Nag Hammadi Library in English. ^ Gareth Lee Cockerill, "The Epistle to the Hebrews", vol. 29 of The New International Commentary on the New Testament. Wm. B. Eerdmans Publishing, 2012, 298f. (fn. 14). Willard M. Swartley, Covenant of Peace, Wm. B. Eerdmans Publishing, 2006, p. 255. Gary Staats, A Christological Commentary on Hebrews (2012), p. 71: "[The writer of Hebrews] is identifying Melchizedek as a king of righteousness and a king of peace. He thus becomes a beautiful type of Jesus Christ who is also the final King of righteousness and the final King of peace." ^ "Jesus Christ is not only typologically linked with the priestly order of Melchizedek, but fulfills and supersedes Melchizedek's person and role" Willard M. Swartley, Covenant of Peace, Wm. B. Eerdmans Publishing, 2006, p. 255f. ^ Martyrologium Romanum ex Decreto Sacrosancti Concilii Oecumenici Vaticani II instauratum, auctoritate Ioannis Pauli Pp. II promulgatum, editio [typica] altera, Typis vaticanis, , p. 476. ^ May 22/June 4 Archived 2014-08-22 at the Wayback Machine. Orthodox Calendar (Provaslavie.ru). ^ Luther's works: First lectures on the Psalms II, Psalms 76-126 Martin Luther, Hilton C. Oswald – 1976 "After the order of Melchizedek, which is understood, first, in accordance with the name. ... Therefore He is the true Melchizedek. Second, this is understood in accordance with the office, because Melchizedek offered the bread and wine"
^ Longman, Tremper (2005). How To Read Genesis. p. 172. ISBN 9780830875603. ^ Bushman, Richard L. (25 April 2017). "Joseph Smith — American religious leader (1805–1844)". Encyclopedia Britannica. Retrieved 30 May 2017. He appointed his male followers to priesthoods, named for the biblical figures Melchizedek and Aaron, that were overseen by the office of High Priest. Dallmann, Robert W. (2013). Melchisedec: A Character Study. Niagara Falls, NY: ChristLife. ISBN 9780991489114. Horton, Fred L. (1976). The Melchizedek Tradition: A Critical Examination of the Sources to the Fifth Century A.D. and in the Epistle to the Hebrews. Cambridge: Cambridge University Press. Kugel, James L. (1998). "Melchizedek". Traditions of the Bible: A Guide to the Bible as It Was at the Start of the Common Era. Cambridge: Harvard University Press. pp. 275–93. ISBN 0-674-79151-7. Manzi, Franco (1997). Melchisedek e l'angelologia nell'Epistola agli Ebrei e a Qumran. Rome: Editrice Pontificio Istituto Biblico. p. 433. ISBN 978-88-7653-136-1. Mathews, Joshua G. (2013). Melchizedek's Alternative Priestly Order: A Compositional Analysis of Genesis 14 :18-20 and Its Echoes Throughout the Tanak. Winona Lake, IN: Eisenbrauns. ISBN 978-1-57506-820-6. "Priesthood of Melchizedek". Let Us Reason Ministries. 2009. Chisholm, Hugh, ed. (1911). "Melchizedek" . Encyclopædia Britannica (11th ed.). Cambridge University Press.